In the conclusion of a two-part feature, our wildlife expert Ed Andrews discovers a species that has made an unexpected return to the county… and photographs some local favourites. The news this year that a wild pine marten has been spotted in Shropshire is nothing short of incredible. This is an animal that was thought to only be found in Scotland and has not been seen in England for over 100 years. Wildlife enthusiast Dave Pearce was walking through woodland near Craven Arms when he spotted an animal running through the trees. He managed to grab a quick photo and sent it to Stuart Edmunds of Shropshire Mammal Group. Stuart has been investigating reports of pine martens in Shropshire for the last five years but has always dismissed them due to a lack of evidence. When he examined Dave’s snap, he was amazed to see the distinctive cream bib of a pine marten. Pine martens are members of the mustelid family that also contains stoats, weasels and otters. They are around the size of a domestic cat and are closely associated with woodland areas, being excellent climbers of trees. Stuart visited the spot where the animal was sighted and set up a trail camera. These are triggered by movement, using infrared light to film both day and night, and can be left out for several days at a time. Stuart managed to get the first ever video footage of an English pine marten using one. British mammals are typically more active at night and are sensitive to disturbance from humans, having an excellent sense of smell. To a degree this explains how the Shropshire pine martens have managed to go undetected for so long; but trail cams can reveal intricate behaviours without any risk of disturbing the animals. We know hedgehogs visit our garden in Bridgnorth most evenings so this seemed a good place to try out our new trail camera. One morning, we were amazed to play back footage of the hedgehog ‘rut’: a male hog was snorting, puffing and making strange posturing movements around a female. Suddenly another hog appeared on the scene and the two males briefly clashed in a courtship battle. Of course the real challenge lies in trying to photograph animals in wild habitats – here, fieldcraft and a knowledge of your target species are vital. I headed out to some woodland near Bridgnorth and found a steep bank covered in a tangle of holly, hazel and hawthorn. I found a path weaving beneath the bramble, which I followed to a clearing with a tree that was the perfect setting for the trail cam. Watching the videos next day, I was fascinated to see how that piece of woodland came alive as darkness arrived. First on the scene was a wood mouse, darting around among the leaf litter and branches. On the second video, the characteristic stripy face of a badger appeared in the corner of the screen and I was treated to wonderful footage of this woodland wanderer gently munching away on the peanuts I’d scattered. I could even see his claws as he padded around. At one point he sat down in the clearing for a good old scratch! As we move into winter, hedgehogs will be hibernating, and pine martens and badgers will be searching for whatever foods are available. For all animals, it’s a hard time and survival is by no means guaranteed. Trail cameras are like a window into their secret world. The price has steadily come down to make them more affordable and they would make the perfect Christmas gift for the wildlife lover in your life! Do one thing for wildlife this month.. 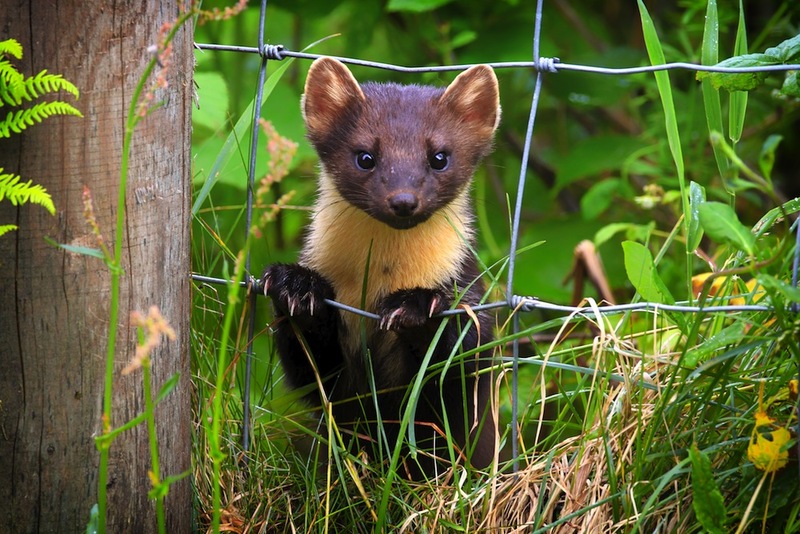 According to Stuart Edmunds, pine martens that live in Scotland and those that used to live in England and Wales are genetically slightly different. The genetic type is known as the haplotype. Until the sighting of the Shropshire pine marten, it was assumed that the English/Welsh haplotype was extinct. By taking some DNA samples from the animal or animals, it would be possible to confirm what haplotype they are. This would tell us if this is a rare relict population of the English pine marten that has somehow survived the persecution and hunting that brought the population crashing down. You can also follow Ed on Twitter @shropshirewild.